With the release of the 2016 Platinum Somalian Elephant coin, the African Wildlife series from the Bavarian State Mint expanded for the first-time ever to include a brilliant platinum coin. Increasingly popular for its new annual designs and beautiful finishes, the Somalian Elephant Series is a great choice for collectors. The 2016 Platinum Somalian Elephant Premium Proof Coin Set is available for a limited time now on Silver.com. Ships to you in an African Wildlife-themed luxury box, with individual coins in capsules. Total mintage capped at 100 Coin Sets for this release. First-ever Platinum Somalian Elephant Coins! Set includes a total of four coins, 1.85 ozt total. Coins consists of .9995 fine platinum. Issued face values in Somali Shillings. Obverse bears the latest African Elephant design. Reverse includes the coat of arms for Somalia. Set features a Certificate of Authenticity. The Somalian Elephant coin series debuted in 1999 as the Zambian Elephant, but shifted to Somalia starting in 2004. 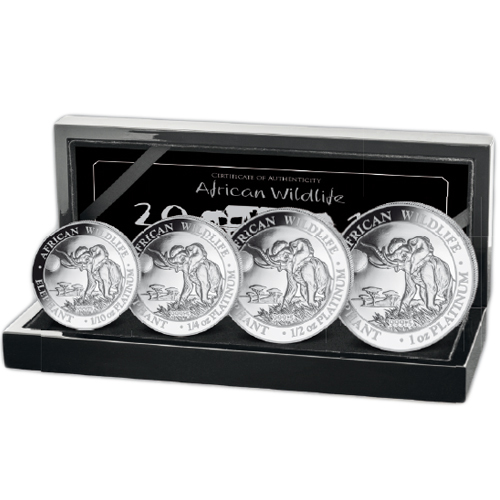 Since its introduction, these coins have been highly coveted by collectors because the design on the obverse of the African Elephant is changed each year. On top of that, the coins originally had extremely limited mintages. For 2016, the Bavarian State Mint released its first-ever Platinum Somalian Elephant coin. These coins are now available in a brilliant premium proof coin set. This 2016 Platinum Somalian Elephant Premium Proof Coin Set includes four coins in total; a 1/10 oz, 1/4 oz, 1/2 oz, and 1 oz coin. The coins in this set all feature .9995 fine platinum, and have varying face values based upon the weight of the coins. The face values range from 100 Shillings for the 1/10 oz coin, 200 Shillings for the 1/4 oz coin, to 500 Shillings and 1,000 Shillings for the 1/2 oz and 1 oz coins respectively. On the reverse of each Platinum Somalian Elephant is the image of the coat of arms for Somalia. It features a singular star against a background of horizontal lines across the heraldic shield. The face value of each coin is engraved on this face along with a year of issue mark. 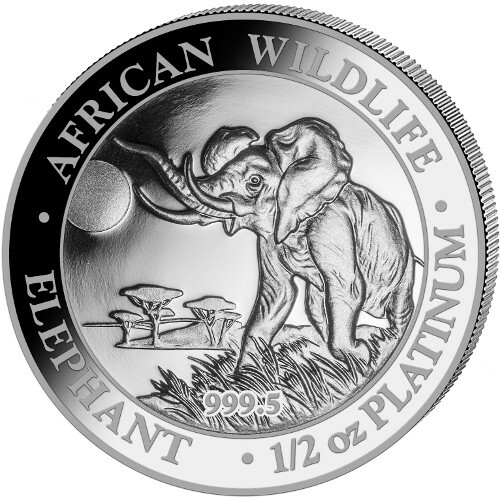 The obverse of the 2016 Platinum Somalian Elephant Proof Coins in this set feature the 2016 design of the African Wildlife Elephant coins. It depicts a large bull elephant standing at the edge of a river, with its trunk raised and a bellow going out into the distance. All Somalian Elephant coins are struck originally by the Bavarian State Mint, which is a state-owned entity of the Free State of Bavaria in Munich, Germany. This premium proof coin set is a product of Emporium Hamburg, a private coin dealer in Germany. We encourage Silver.com shoppers to reach out to us with questions. You can contact Silver.com customer service at 888-989-7223, online using our live chat, or via email.